Quartette Vocals féminin US formé en 1949 à Sheboygan (Wisconsin), au nord de Chicago (Illinois) par le ténor Jinny Osborn. Les Chordettes étaient composées de Jinny (Lockhardt) Janis, Nancy Overton, Lynn Evans (Mand) et Carol Bushman. 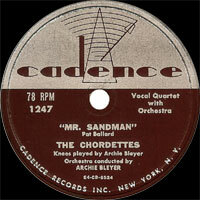 Elles ont connu la gloire dès 1954 avec "Mr. Sandman" chez Cadence Records et de poursuivre une carrière à succès en squattant les charts jusqu'au début des années soixante. Elles se sont séparées en 1961. 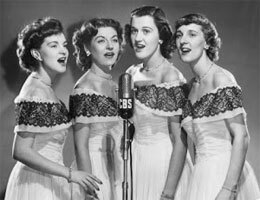 The Chordettes were one of the longest-lived Vocals groups with roots in the mainstream pop and Vocals harmonies of the 1940s and early '50s. Although the four women's arrangements owed more to the Andrews Sisters than doo wop, they did, unlike many of their peers, prove fairly adaptable to the rock era. First establishing themselves with the huge (and non-rock) pop hit "Mr. Sandman" in 1954, they continued to chart in the last half of the '50s and the early '60s, often with covers of rock and R&B songs. The 1958 number two hit "Lollipop" was the biggest of these. Although the group's sound (at least in retrospect) fell among the Whitest and squarest of rock artists, they introduced enough rock into their repertoire and production to sound more contemporary than they had on songs such as "Mr. Sandman." Jinny Osborn was exposed to harmony singing via her father, who was president of "The Society for the Preservation and Encouragement of Barbershop Quartet Singing in America Inc." She formed the quartet with three college friends, and they became regulars on Arthur Godfrey's television show for four years in 1949, singing a cappella in the barbershop style, and recording for Columbia. Godfrey's musical director, Archie Bleyer, married the Chordettes' bass singer, Janet Ertel, around the same time he began his record label, Cadence. On Cadence, the group began to record with musical backing, though the barbershop elements are still well to the fore on "Mr. Sandman." Originally a B-side for Vaughn Monroe, the bouncy, somewhat novelty-oriented tune (complete with a deep-voiced "Yes?" from a voice representing "Mr. Sandman" at one point) made number one for seven weeks. The Chordettes were among the White pop acts that covered rock and R&B songs in the mid-'50s for the pop market, as early rock & roll began its successful threat to take over the mainstream audience. In so doing, they managed to split sales with the Teen Queens on the early doo wop classic "Eddie My Love," which made the Top 20 in versions by both groups. They also covered a song by Ronald & Ruby, "Lollipop," in their characteristic full-round-like arrangement, complete with popping sounds. This was their best rock, or at least rock-ish, tune, though they had continued to record straight pop songs, too, and had substantial hits with singles like "Born to Be with You" and "Just Between You and Me." In the late '50s and early '60s, the Chordettes continued to alternate between pop songs and ones with an eye on the rock market, including covers of the Coasters' "Charlie Brown," Paul Anka's "Lonely Boy," and Dodie Stevens' "Pink Shoelaces." They even did some recordings with King Curtis on sax. 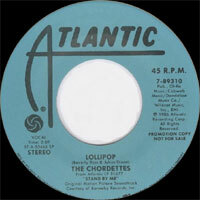 After "Lollipop" there were a few more hits: "Zorro," "No Other Arms, No Other Lips," and "Never on Sunday." They disbanded shortly after "Never on Sunday" made the Top 20 in 1961, however, when Jinny Osborn left and the group couldn't find a replacement with whom they were happy.